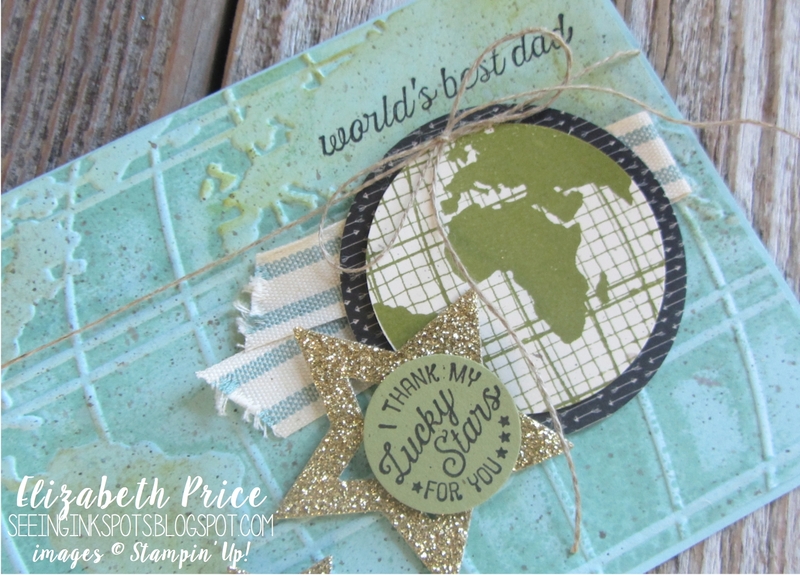 Of all this great citrus themed inspiration from Hand Stamped Sentiments I love the limes the most. In fact I am quite addicted to sliced limes for Diet Coke or a street taco with fresh squeezed lime. I love Love LOVE limes. From their smell to their tangy flavor they brighten my day. 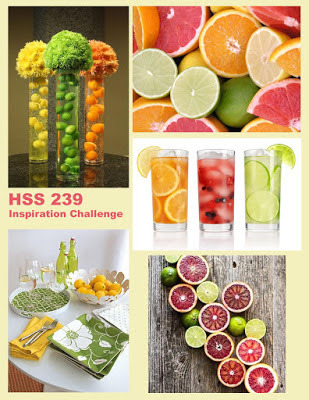 With all the lime talk your wondering what that has to do with my take on the inspiration board. Well here it is... I started with the intent to watercolor a lime colored long panel, but when I grabbed my ink I gravitated toward the new Emerald Envy. 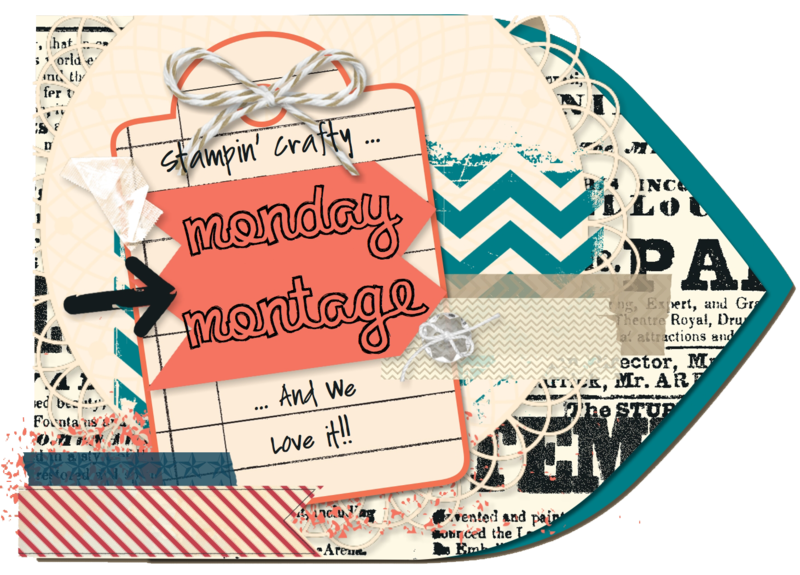 As I kept creating I decided to pull in the yellow, orange, and deep pink tones from the board. Since there are no rules, grades, or payments based on my final take on the inspiration I can do whatever I stinkin' please! Right? Plus, I didn't want to be too literal. These boards are meant to inspire, to start, to give a jumping off point for creating. Then once the juices are flowing you can let into them and create for the heart. The tall skinny cylinder vases and the beverage glasses inspired me to go with a 3 3/8" x 6 3/8" side fold card. 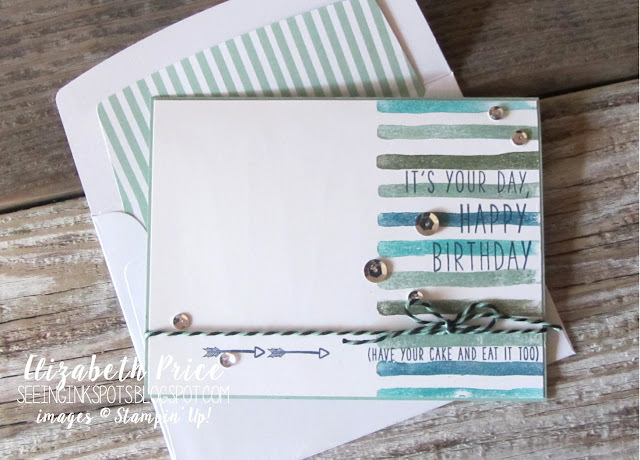 The background is watercolored and then edged with a Basic Black Stampin' Write Marker. 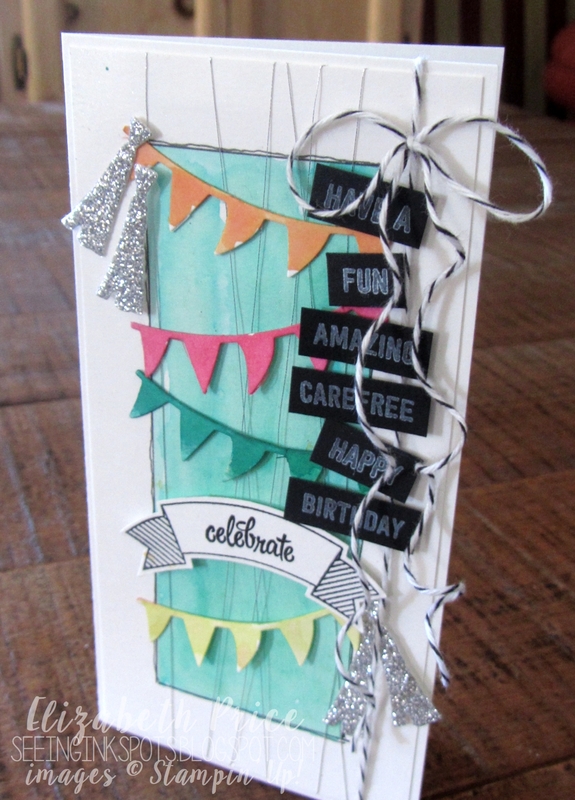 I used Shimmer White Card Stock for everything except the white on black greetings. 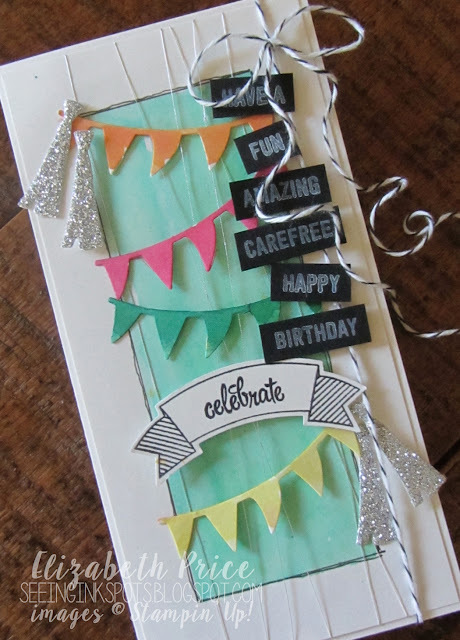 For the banners I used the Balloon Frameits and then watercolored them with Tangerine Tango, Melon Mambo, Emerald Envy, and Daffodil Delight. 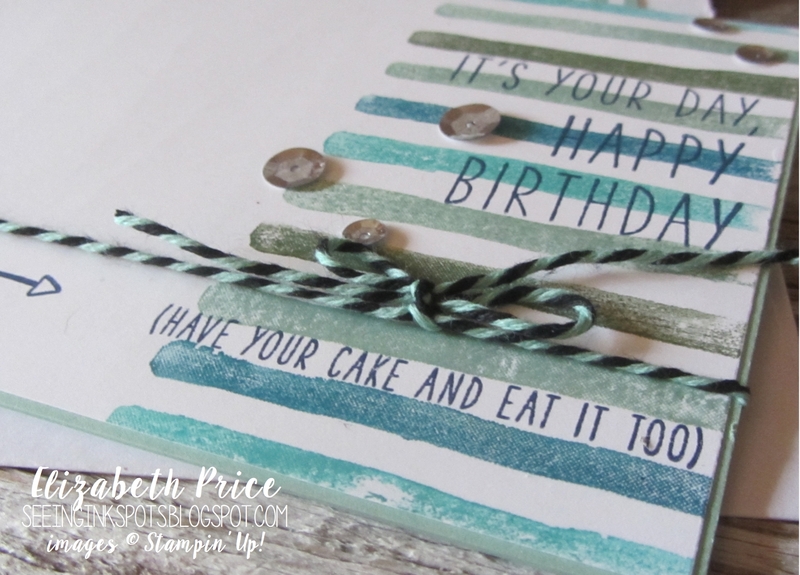 The chalkboard style greeting and the banner images all are from the brand new set Thoughtful Banners and the coordinating punch is called the Duet Banner Punch. Both are available in when the new catalog goes live on JUNE 1ST!!! They are sold separately or as a bundle. Welcome stamp friends to another Monday Montage Blog Hop! 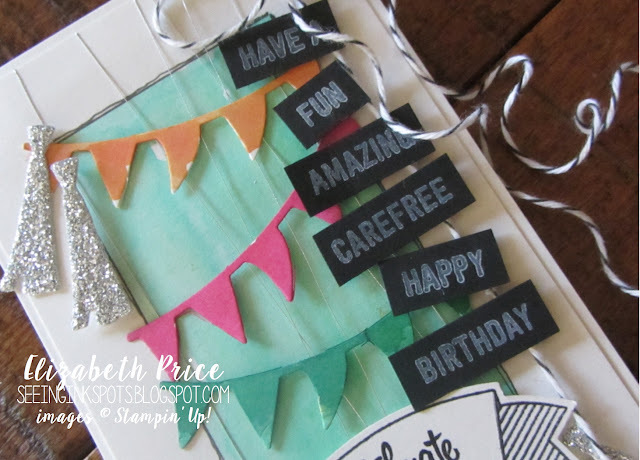 I thought I would share a card and box designed to be perfect for guys using the stamps from May's Paper Pumpkin Kit and the Cutie Pie Framelits. One of my go to framelits is the Cutie Pie set. I can find lots of uses for each piece in the set with the exception of the "eat me" framelits. I love the greeting; it's so snarky and sassy and totally me, but this is the first time I put them through my Big Shot. After I cut them and before I popped them out I ran Snail over the back so that it would be easier to adhere the letters to the tag. That worked like a charm except when I got to the dot of the exclamation point. For my masculine themed birthday card I was totally jazzed to see the latest challenge at TGIF. It's so cool. It's all about being inspired by everyone that shared their creations with the challenge site all month. 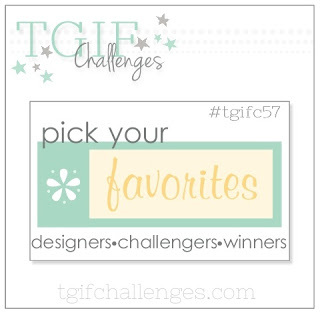 It could be their designers, winners, or challengers. 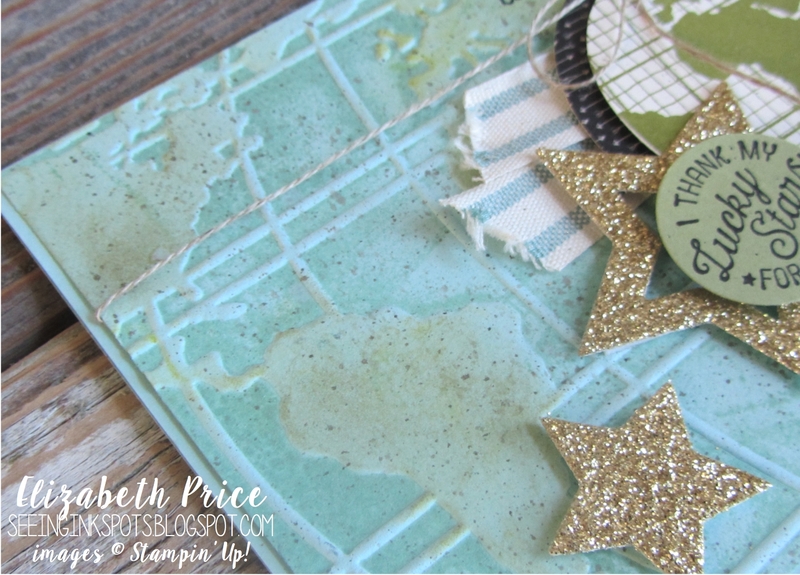 I found total inspiration from a very cool card; my muse is Heather Heroldt. To recreate the stripes along the right side I used the Brushstroke background stamp. 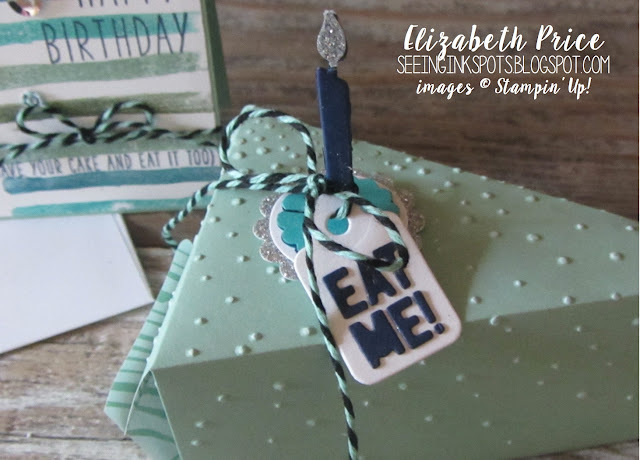 I inked up the stamp with Bermuda Bay, Mint Macaron, Island Indigo, and Old Olive Stampin' Write Markers. The greeting images were all stamped with Night of Navy. For the envelope liner I cut a piece of Envelope Paper with the Envelope Liner Framelits. The liner framelits are being retired which saddens me, but mine are staying up front in my stash of card making supplies. They just add such a special extra detail to take every hand made card way up and over the top. 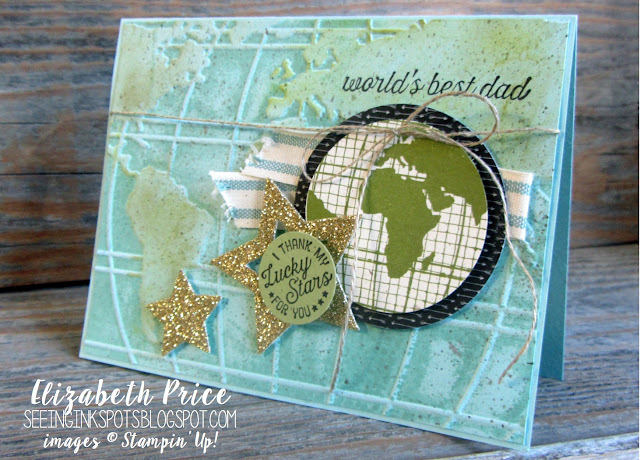 World's Best Dad is My Dad! Yes you heard it right. The world's best dad is MY dad! He is the cutest dude ever. He's kind, he's always respectful of others, he plays a mean piano, he is one of those quietly funny guys, he's a handy fixer tinkerer kind of man, he truly believes quantity is quality, and he loves my mom, myself, and my family without end. He is Lynn Salisbury!!! 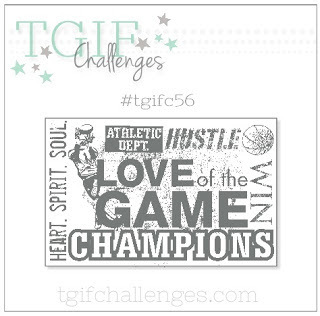 When I saw the theme challenge at TGIF I knew I had to share this father's day card. 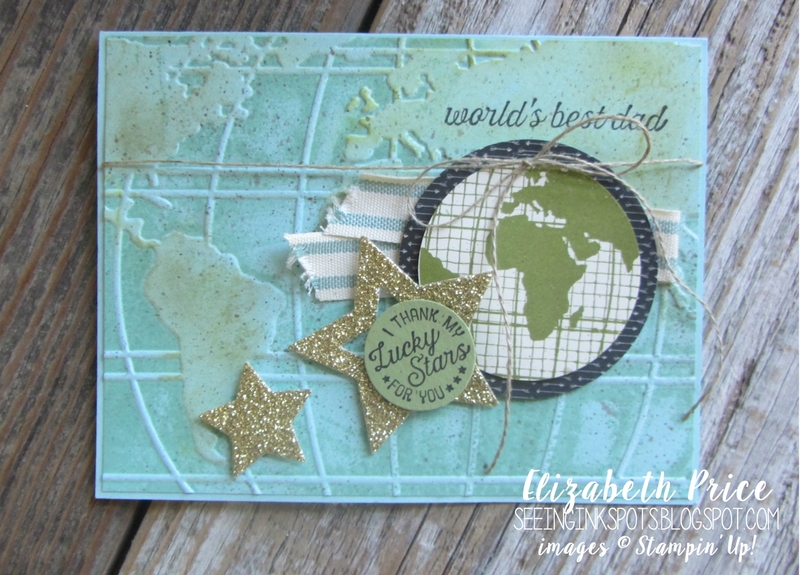 A card featuring the World Traveler TIEF, the Going Global stamp set, and a piece of the Going Places DSP. To start this card I preinked my World Traveler TIEF with Pool Party ink and then ran a piece of Pool Party card stock through the Big Shot. Next I rubbed Crumb Cake ink on the continents using a Sponge Dauber. To achieve the splatter effect I gathered ink in the lid of my Early Espresso pad with an Aqua Painter and flicked it all over.